Sadly our vintage caravan days are at an end due to Barbara's on going ill health and mobility issues, so our little collection is for sale. Something for everyone, bondwood, fiberglass and aluminium, all registered and ready to roll (the bondwood is on non transferable club plates). Please have a look HERE, send a PM or phone for info. All have been at the various Nationals in the past 6 years. There's time to get a van for this years Nationals if you are van-less! Olympic is a 1968 Debonair, 14ft long. Previous owner converted to single beds, they have easy access underneath. Pics available, please send me a PM with your email and I'll send some. Hi Any chance of some interior shotsbof the Astronaut?regards Adrian aj@aerocoffeeco.com.au 0452505011,where are you? 1959 Phase III Vanguard Vignale. I have too had to to give away caravaning, and my son Stephen and his wife Kat are going carry on flying my Olympic banner and flag from here on. I no in my right arm since breaking it on 21/4/'17. 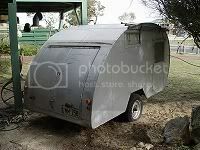 We will miss our vintage caravan friends dearly , but life has to go on to suit our disabilities. It must be hard for you as a Gold Medalist in caravanning to have to give it up. We were only novices but enjoyed the bit we did, three Nationals in different vans being highlights. I'll still be lurking about and hopefully having some input. We have all the time and means now to do as we please but ill heath trumps all, hopefully everyone makes the best of things while they can. I'm pleased to say the Olympic has found a new, warmer home with a Forum member at Tweed Heads. The Astronaut and bondwood are still available and for those who enquired about the Astronaut and may still be interested (or anyone else) I will drop the price by $1000 up to the 21st August. The rego expires on 26th August and with an unexpected health issue requiring surgery sometime after the 21st I would like to see it move on by then. Send a PM or phone, see details on the original post. Where to start, a lot has happened since this initial post, but the vans have been thinned to zero in the household now. The bondwood was the last to go a couple of weeks ago, heading off to a new home in SE Qld. The Astronaut moved out before Christmas to a new home at Bellambi for the moment, the owner hoping to move to the Central Coast soon. It looked good behind it's new tow car, a Chrysler 300 and of course I took a few photos. My befuddled brain found me deleting them by accident while trying to sort out the new digital camera. I contacted the new owner to see if he could send me some only to learn that the first trip away found someone at Nabiac had backed out of a driveway, 'without due care', taking out the back of the Chrysler and the front of the Astronaut. The insurance was still being resolved, but as seems to be the case with old vans it was considered a write off. The new owner was pretty confident it would be repaired after the payout, probably in Brisbane, so I hope that is the case - they don't make 'em anymore, can't afford to loose any! So, I'm back to a big open driveway I could park about 6 cars in, but not for long. Monday will see a 4 post hoist installed where the bondwood used to reside and I intend putting it to good use. Having become a Septuagenarian recently I decided I'm too old for this rolling around the ground caper so we will see how this works out. Hopefully there will be an old van in my future again, the 'right' one for my old Vauxhall to take to shows and outings is out there somewhere, no tripping about the countryside though due to Barbara's poor health.